The following interview took place during President Heydar Aliyev's first official visit to the United States on August 3, 1997. It was the eighth day into his 11-day trip in the United States (July 27-August 6) during which time he visited New York City, Washington, D.C., Houston and Chicago. Two days earlier, President Aliyev had met with U.S. President Bill Clinton and signed three major oil contracts in the White House. This was President Aliyev's third visit to the United States. He had addressed the United Nations (1994 and 1995) and on both occasions met privately with President Clinton whom he had met on other occasions including at the Summit of the Organization on the Security and Cooperation in Europe (OSCE) in Budapest in 1994. Rarely do journalists ask President Aliyev personal questions. When foreign journalists get the opportunity to interview him, they usually ask routine questions that relate to the latest political and economic developments in the region. On the other hand, Azerbaijani journalists tend to follow a more formal traditional journalistic style established during the Soviet period which avoids personal topics. Therefore, I have tried, as in other interviews beginning in 1993 see AI 2.2 (Spring 1994), AI 2.4 (Winter 1994), AI 4.2 (Summer 1996), AI 5.1 (Spring 1997) and AI 7.4 (Winter 1999) to introduce topics that would reveal some of his interests, his character and personality. As I was among the 60-member entourage (the only non-Azerbaijani) accompanying the President on this tour throughout the United States, I intentionally avoided the usual issues which had been discussed publicly on a daily basis (see "Issues - a Presidential Perspective"). This interview was conducted on the flight between Houston and Chicago. Rauf Huseinov served as interpreter. 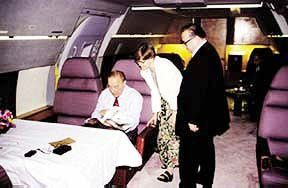 Photo: Betty Blair, Editor of Azerbaijan International, with President Aliyev on the chartered plane between Houston and Chicago on August 3, 1997. Minister of Foreign Affairs Hasan Hasanov looks on. Let me start by asking you to comment on the hospitality and warmth that you've received here in the United States. Less than ten years ago, the United States and the Soviet Union considered each other the worst of enemies. This fear manifested itself in the build-up of vast military arsenals on both sides even to the neglect of responsibly meeting the social needs of both of their populations. Both nations boasted the superiority of their own system over the other's. And they both exploited their own propaganda tools to demonize the other as the "insidious bad guy." Yet, today the warmth and acceptance that you've received in the United States from the highest level down, contradicts this era of suspicion and animosity. Sometimes, it's hard to remember how cold and suspicious people used to act towards each other. How do you explain this phenomenon? As you know, the Soviet Union no longer exists. As a super power, the Soviet Union (of which Azerbaijan was a part) competed with the United States. A Cold War raged for such a long time between us because the world was basically split into two camps-capitalists and socialists. The Soviet Union led the socialist camp and managed to attract various countries to its side, especially African countries after they gained their independence from colonization. 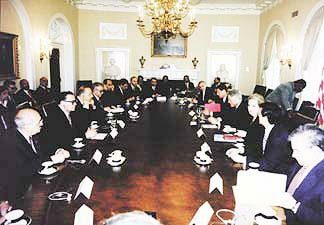 Left: President Aliyev meeting with President Clinton in the White House on August 3, 1997. But now the Soviet Union has disintegrated and the Cold War has ended. If the Soviet Union had not collapsed, of course, Azerbaijan would not be an independent country today. Had it not collapsed, none of the former Soviet Union republics, including Ukraine, with its sizable population of 50 million people, would be independent. Photo: President Aliyev and his new grandson and namesake. August 7, 1997, in London. Photo by Rafig Bagirov. But now finally, Azerbaijan has achieved its national independence-once again after 70 years! Now we're trying to strengthen and maintain our independence, and I think this is one of the most important reasons why there is such a warmth between the United States and Azerbaijan. You have to take into account that there are countries in our region which have tried to strangle our independence. That's why we look to the United States as an opposing strength against those forces who want to choke us. In other words, we look to the United States as a country which will help us to preserve our independence. Secondly, we are building a democratic state in Azerbaijan based on law and secularism. In other words, Azerbaijan is making great strides to live in accordance with Western standards. This is another reason for the warmth and kind relations. And thirdly, we have established broad expansive economic relations with the United States. You've seen so many of these American companies, particularly the oil companies, visiting Azerbaijan. These past two days, both yesterday and today, I met with the presidents and CEOs of many of these companies. It turns out that the companies which have established themselves and are already working in our country want to expand their operations. And those which have not yet begun to work with us are looking for ways to get started. For example, one company admitted that a year and a half ago their Board had made the decision not to invest in the Caspian Sea region. But today, they've completely changed their minds. They confessed to me that they had made a mistake and that they are arriving late on the scene. Now, they're asking us to give them a chance to get involved with developing a field in Azerbaijan. So, all these factors together contribute to the warm, hospitable relations that we are witnessing here in the United States. For the past week, you've been emphasizing several major issues in your speeches. I'd like to know if there are any other areas that you consider critical for our readership to understand. I'm referring to issues such as (1) the resolution of the Nagorno-Karabakh conflict, (2) the need for Congress to repeal Section 907 of the Freedom Support Act, (3) the issue of the illegality of Russia supplying Armenia with $1 billion of arms that obviously were used in the Karabakh conflict against Azerbaijan, (4) Russo-Iranian relations, (5) the "status of the Caspian" in terms of who "owns" the sea and can develop its oil resources, (6) and finally, the business opportunities for foreign investors in Azerbaijan. My question is, are there other major issues that our readers should know about? These are the main problems. If you succeed in conveying these ideas to your readers, that's more than enough. Let your readers understand those problems, then I'll give you some more. Much of your time here in the United States has been spent making speeches. It's the same back in Azerbaijan. I was particularly impressed with both your speech and the question-and-answer session that followed at Georgetown University. Your speech direct and concise while at the same time providing necessary background information that Americans needed to know to understand the issues related to Azerbaijan. As I've watched you over the years, it seems to me that much of your power as President is bound up with your rhetorical ability - your ability to express yourself and to persuade others. I imagine that you've spent a lifetime making speeches. I was wondering about some of your early experiences in public speaking. Since you've brought up the question, I'll tell you this is a talent that I was born with it. It's innate. You can't get it simply by studying, or by working hard or even by making many speeches. Obviously, my life experiences do play an important role. I've done a lot of things. I've had a lot of experiences. I've seen a lot of things, and I've stood in front of many audiences. Therefore, the role of experience can't be denied. But the basis of my speaking ability is a talent which comes from nature. You're born with it. If you don't have it, no amount of experience will help. Yes, it's true from my youth that I've always been a person who could express my views clearly. I started making emotional speeches when I was about 17 or 18 years old. But you've never seen me read my speeches. I never prepare in advance. And you have no speech writers like most other presidents do? No, I don't have a speech writer. Let me tell you what happened a few days ago, when we were in the White House, Clinton was making a speech from his notes and Al Gore also read from a text. Gore spoke when he was signing one of the contracts as did Clinton. They both had texts. But not me. It's all here (points to his heart). Do you practice your speeches before hand? No. Ninety percent of it comes to my mind when I'm in the process of speaking. Maybe, I prepare about 10 percent. But, there are times when I'm in the middle of speaking, and I change my thoughts. But, in general, I never practice before hand. You never write down a single word? Never. You've seen me. I never have any notes. Not even a piece of paper. Never. I've been speaking this way for decades. Even when I was a member of the Politburo, I was different from others because of my speaking ability. Except for me, no one spoke from his heart. Everyone read their texts. Everybody had notes. But many times there are so many distractions going on in the room-TV cameras, microphones, people moving around. There are so many things happening. How do you stay so concentrated and not allow yourself to be disrupted no matter what's going around you? It's my specialty - my ability to remain concentrated. Do you ever go home and say "Ah, I forgot to say something important. I left something out." If you're interested in knowing, let me tell you that when I make a speech, my brain works with great power, I'm very conscious of that. Sometimes, I even surprise myself. For example, when we were signing the agreement, President Bill Clinton gave a statement, and then I had to give mine. To tell you the truth, I didn't know what I was going to say beforehand. But very quickly, all the ideas came to mind. In the end, I was quite satisfied with my own statement as were a number of people who commented to me about it afterwards. You once told me that when you were growing up in Nakhchivan, you spent a lot of time going to the theater. Has theater played a strong influence on your rhetorical ability? [Nakhchivan (pronounced NAHKH-chi-vahn) known as the Autonomous Republic of Azerbaijan, is the non-contiguous section of Azerbaijan located west of the mainland and separated by a strip of territory which was given to Armenia by Stalin]. No, I wouldn't say so. Theater is a hobby with me. I go to the theater because I benefit a lot from it. It makes a deep impression on me. It's very influential on me. But I wouldn't say that theater plays a role in my speech-making. Theater is very powerful for those who understand it, but it's not for everyone. I understand theater, and I'd have to admit it has a greater impact on me than either television or cinema. Your granddaughter likes to give speeches, too. I've seen her get up in public and with great poise recite poetry that she's written herself. Takes after her grandpa! That's true. Zarifa [about ten-years-old] is a very courageous girl, and she's learned English very well. Can you tell us a bit about your private meeting with Secretary of State, Madeline Albright, a few days ago at the Blair House? Well, we talked about the relations between the United States and Azerbaijan. We spoke about the settlement of Nagorno-Karabakh and about the resolution of the conflict between Armenia and Azerbaijan. These were the main issues. Mrs. Albright has a very positive attitude towards Azerbaijan. And she has a very sincere, genuine relation towards me. I have a great deal of respect for her. I consider her a very wise person. President Clinton has chosen very well in selecting her to fill this Cabinet position. She's a very useful and productive person. What do you consider to be some of the highlights of this official visit here in the U.S. apart from meeting President Clinton and Vice-President Gore and signing three contracts in the White House? What were some of the other moments that gave you a great deal of personal satisfaction? It was a very special moment for me when a lady came up to me and showed me a photo that had been taken 20 years earlier. It was a photo of me with the U.S. Ambassador to the Soviet Union at that time. I appreciated her gesture for two reasons. First, that an American family had considered that meeting which had taken place so many years before as such a momentous occasion that they had kept this photo for such a long time. That was remarkable to me. It meant that the meetings and discussions that I had in the past also made an impact and impressed someone at that time. It seems that her husband had been the assistant to the Ambassador. And that woman, a stranger to me, brought this photo to me 20 years later and asked for my autograph. 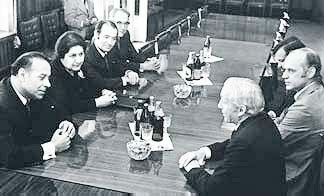 The Photo of Aliyev - 20 years earlier brought as a souvenir. At the same time, that photo made me recall those years long ago, and I caught a glimpse of myself and realized that I haven't changed so much. I look quite the same. That, in itself, was gratifying. Obviously, the sweetest moment for me was the birth of my grandchild yesterday. I can't imagine anything sweeter than that! It was an extremely special moment for me. And where did I hear about it? In Houston-8,000 miles away from home during my visit to the southern-most state of the U.S. on the border between the U.S. and Mexico. Quite amazing, isn't it? I haven't named him yet. I'll stop by London [where the baby was born] in a couple of days and name him there. [Following tradition, three days later, he bestowed his own name, "Heydar," on his grandson. 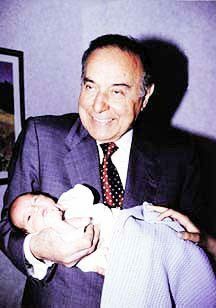 This is the first grandson to carry the Aliyev name]. Another personal highlight of this trip was meeting Dr. Michael DeBakey. He's a very great person. He was the first person ever to conduct heart bypass surgery. Today when we met him, he mentioned that he has performed some 60,000 surgeries. Imagine how much life he has given to so many people. As you know, Dr. DeBakey was the only foreign specialist that Russian President Boris Yeltsin invited to participate in his own recent heart surgery. 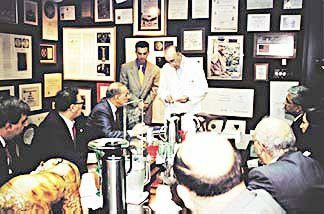 DeBakey is quite old, isn't he? He's in his 80s. That's why I respect him so much. So aged, and yet he still works so actively. You saw him. Maybe in the U.S. you don't value him so much - I don't know. But he's an extremely valuable person. That's why I wanted to visit him. That's why I made time to include him in my program while I was in Houston. He's a very famous person - a very great person. And he's created a great medical center [Houston Medical Center] there in the middle of a desert. I knew him from articles by correspondents. It's an area I'm interested in because ten years ago I had a heart attack myself. So, you've been in contact with him? No, he's involved with surgeries. There was no need for me to have surgery. When I had a heart attack back then in 1987, many people told me that I wouldn't live very long. That was August 1987 - ten years ago. I had to stay in the hospital three months. They told me I wouldn't be able to work anymore. But, you see, here I am - still alive and working. Your schedule is daunting. Don't you ever stop? Everybody in the back of the plane is wiped out and exhausted. This is the eighth day of your trip. Everybody's so tired, but you're still going strong. How much rest do you get everyday? How much sleep? Very little-not more than six hours. Do you take a rest in the middle of the day? So where do you get all this stamina? Let me ask you about some of the gifts that you carried with you to the U.S. Tell me about the carpet which you presented to President Clinton. I understand it was especially designed with the portraits of Bill Clinton and his wife Hillary together. I also brought a separate rug for their daughter, Chelsea. President Clinton was quite pleased with them. He told me that Chelsea stopped by that morning to look at them in his office. He said she was quite happy and liked them very, very much - they all did. That's not the typical thing to do. To give a president a gift that features both him and his wife and child. Where did you get the idea to do that? It was my idea. I know that for every man, his wife and children are very dear - very precious to him. That's why I did it. It's a way of commemorating them all in an art form that will last for centuries. Many people have varied opinions about Hillary. A lot of people don't quite know what to make of her. I don't know Mrs. Clinton very well, although I've met her on occasion. When I've spoken with her personally, she has left a very good impression on me. Anyway, it's impossible to be liked by everyone - especially if you're a public figure. Azerbaijanis have a habit of bringing back gifts to the people they love when they return from a trip. What's your gift to the Azerbaijani people? The greatest gifts are the achievements that we secured here in the United States. We signed an agreement with President Clinton, strengthening the ties between our two countries on many levels. These agreements will be of great historic value. In addition, Mr. Clinton and I had a very frank discussion together about the situation and relationship of our countries to each other. You witnessed the meetings with the presidents of those oil companies who signed contracts with us - the presidents of Chevron, and ExxonMobil and Amoco [preliminary contract]. Remember, I asked them if they had ever visited the White House. They all told me "No." Don't forget, some of those companies have been in existence for 100 or more years. I joked with their leaders, asking them from all those contracts they had signed all over the world, if they had ever signed one in the White House. They admitted they hadn't. Well, I did that. I brought them to the White House. It was a momentous ceremony. Never in the history of the White House has there ever been an occasion when three major oil contracts were signed. These are the gifts I bring to my people. From Azerbaijan International (5.3) Autumn 1997.